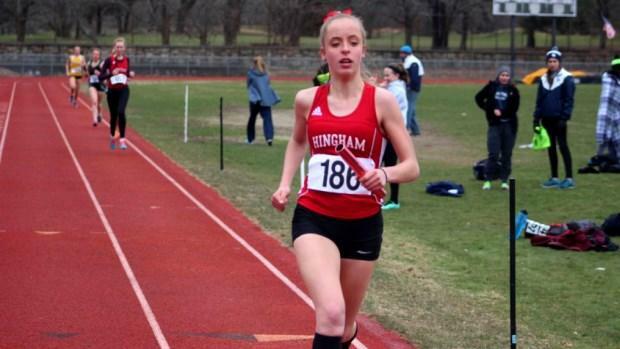 Massachusetts' schools dominated the girls' competition at the 50th annual Knights of Columbus Relays. The meet was held Saturday at Mount Pleasant's High's Conley Stadium in Providence, R.I.
Millis clocked the fastest time of the day to capture the Division 2 race. The quartet of Michaela Hafford, Abby Miller, Lucy Clayton and Bethany Steiner combined for a winning time of 23 minutes, 11.80 seconds. The Mohawks were comfortably ahead of second-place Westerly, which was timed in 23:28.30. In the Division 1 race, Hingham claimed the top prize with the foursome of Heather Linscott. Margot Murphy, Maddie Mildrum and Caroline Johannes combining for a 23:15.60 clocking. Fellow Bay Stater Bishop Feehan was second overall in 23:43.90. Brookline was third overall in the boys' Division 1 race with a time of 19:19.0, the fourth fastest of the day. Parker Charter was second in the Division 3 race with a final time of 19:30.60.